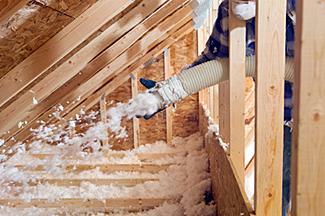 Insulation is crucial to your home. The right insulation will help lower your energy costs, keeping your home warmer in the winter and cooler in the summer. What types of insulation are available? When should you use them in your home to get the most benefits available? Before you begin looking at various types of insulation, check for any applicable code requirements, especially for new construction. 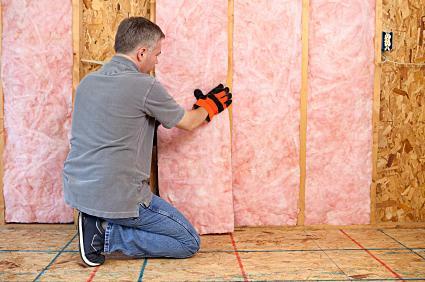 If you aren't sure what type of insulation to get for your home, visit your local home improvement or building supply store and ask to speak to a specialist. He'll probably want to know what type of construction your home is, such as brick, stone or wood, as well as the age and condition of your home to help determine what type is best. There are four main insulation types, and not all of them are suitable for every area of the home. This insulation type is constructed of mineral fiber, which generally consists of rock wool or processed fiberglass. Batt and blanket insulation can be used throughout a house, including walls, ceiling and floors. The least costly in most cases, this insulation fits best between studs, rafters and joists. Most of the time, its standard widths work well between framing. Batts can usually be bought in precut sections, while blanket insulation is usually bought in rolls. An R-value per square inch of R-3 is often found in batt and blanket insulation. Batt and blanket insulation works well in both new and existing homes. Use it if you plan on adding insulation in a do-it-yourself job, and over large areas such as attic floors and ceilings to help save money. Batts are also recommended for brick homes, to help cut down on the freeze/thaw that may occur when the bricks get wet, as well as for cathedral ceilings. If you need to reach hard-to-fill and hard-to-fit areas of your home with insulation, then loose fill insulation is a good choice. This insulation is blown into various areas of your house, and while it may be more expensive, it does a good job of providing insulation. Loose fill insulation often consists of cellulose fiber, created out of recycled newspaper. This insulation should be chemically treated to make it moisture and fire resistant, and it works well in virtually any area of the house that needs insulation. Its R-value per square inch is usually R-3 or R-4. Use loose fill insulation along with batts and blankets or rigid board insulation to help fill up any gaps that are left over once the more inexpensive insulations are in place. Because it can be blown in nearly anywhere, it works well for adding additional insulation to uninsulated, existing walls and floors. Loose fill insulation also works well in homes with cathedral ceilings, particularly those that are unventilated. Spray foam insulation is actually a liquid insulation that is sprayed into various cavities of a building. The liquid typically consists of a foaming agent combined with either a polyurethane or a modified urethane. Once the liquid is sprayed into the various cavities, it converts to a solid plastic, consisting of millions of miniature air-filled cells. Because the liquid mixture must be measured and mixed precisely, spray foam insulation should be handled by a professional. Just like loose fill insulation, spray foam is more costly than typical batt and blanket insulation, but its efficiency often saves a homeowner money in the long run. Spray foam insulation can be used with batt and blanket or rigid board insulation to fill up gaps and cavities where less expensive insulations can't reach. It can also be used alone over large areas, such as basement walls, but this can get expensive unless the house is in a climate that would allow the saved energy costs to offset the cost of the installation. Spray foam insulation works particularly well in older homes, because they often have multiple gaps in the exterior walls that the foam can fill easily. If you are looking for insulation that offers variety in R-values, then rigid board insulation might be your best choice. With R-values per square inch anywhere from R-4 to R-8 per inch, rigid board insulation offers a good selection of varying thicknesses. This type of insulation works best in basement walls, on concrete slab edges and with flat roofs and cathedral ceilings. It typically must be used with some other type of building-code required material, such as gypsum board, and if it is used for exterior areas, it should have weather-proof facing as well. Pair it with batt or blanket insulation inside basements and in attics for more effective coverage, and with blown in or spray foam insulation in tight corners to seal up all gaps. Use rigid board insulation with stone and brick homes, as well homes with high or exposed foundations. 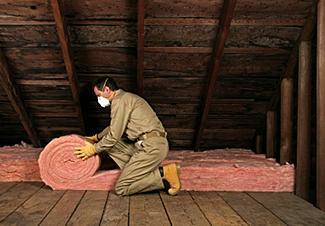 With the rising costs of heating and cooling, installing the proper insulation is very important. While some people think that just about any insulation will work, there are actually several factors that go into figuring out just how much insulation you need as well as which type should be used in your home. The R-value plays an important role in the amount of insulation you choose. R-value refers to the insulation's ability to slow the transfer of heat. 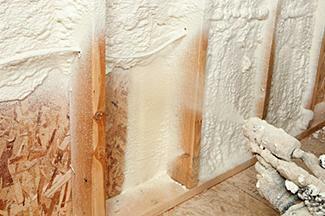 The higher the R-value, the better the insulation is able to resist the heat flow. R-value needs differ depending upon the area of the country in which you live. For example, a house in New England will need an R-value of 49 in an attic and 25 in a basement, while a home in the South would need a ceiling or attic R-value of 30 and a basement R-value of 5. Find out what the R-values you need by location at the Department of Energy. What type of home is your house? Does it have more than one story, a basement, crawl space and/or cathedral ceilings? These factors will also determine how much insulation and the types of insulation that will be needed for your home. It is difficult to add new insulation to walls and ceilings of homes unless you are in the process of adding an addition. You can, however, take a look at your attic, your basement, crawl spaces and any unfinished areas of the home to see how much and what type of insulation is there. If you find areas with no insulation, old insulation or extremely thin insulation, your home may require additional. What type of heating/cooling unit do you have for your home - electric, gas, furnace, central unit, etc.? Depending on how your heating and cooling system is installed, you may require additional insulation. For example, if your home has ductwork, this must be insulated or you could be losing energy as you heat and cool your home. Your pipes also require insulation; check out the areas near your furnace and water heater to see if your ducts and pipes are insulated or not. If you have no ductwork, or your ductwork is fully insulated, you will need less new insulation than a home with uninsulated ductwork. How old is your home? 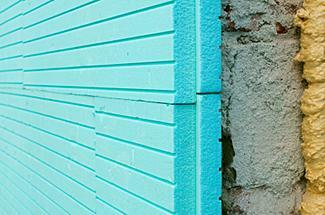 Older homes typically need more insulation than newer homes. This is because newer homes may be built with the aim of lowering energy usage, and are more likely to have taken advantage of newer insulation types, such as loose fill. Older homes may have more uninsulated areas, such as the crawl spaces, ductwork and pipes. To determine how much insulation your home will need, you will need to visit these areas and measure them if they are uninsulated to determine how much will be required to fill them. Whether you are building a new home or just adding additional siding to an existing home, be sure you find out exactly what type and how much insulation your home needs before you begin any insulation projects. Proper insulation will save you hundreds in saved energy costs over the life of your home, so take the time to get the best insulation for your home and location and reap all its benefits.